Engineers inspecting a suspect electrical distribution box removed from the shuttle Endeavour after a launch scrub last week have found blown internal fusing that could be the result of an external, yet-to-be-identified short circuit somewhere in the ship's complex electrical system, officials said Wednesday. But they cautioned that troubleshooting is not yet complete and a problem with the box itself has not yet been ruled out. Hoping for the best, engineers installed a replacement aft load control assembly switching box in Endeavour's engine compartment, but initial testing has been modified to make sure the new box is not inadvertently damaged by whatever caused the presumed short Friday. Endeavour was grounded when telemetry indicated one of two redundant "strings" of fuel line heaters used by one of the ship's three hydraulic power units had not activated as required. Testing showed no obvious problems upstream of an aft load control assembly switching unit that routes power to the system and no obvious problems with the downstream heaters or thermostats. On Saturday, engineers decided to replace ALCA No. 2 on the assumption that something had failed inside the box, preventing power from reaching the heaters. 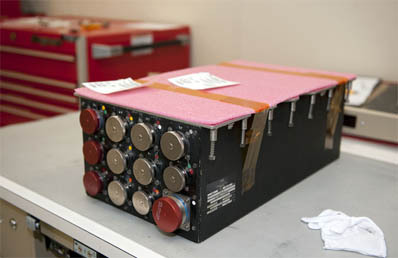 The box was removed from avionics bay No. 5 in Endeavour's engine compartment Monday, clearing the way for installation of a replacement. The ALCA is one of three in the aft compartment that routes power to nine critical subsystems, including the hydraulic system, from three major circuits, or buses. On the assumption a fault would be found in the suspect power box, NASA managers said Monday Endeavour's launch would be on hold until at least May 10 to give engineers time to install the replacement ALCA, retest downstream systems and to ready the shuttle for another three-day countdown. If additional testing confirms an external short -- and if engineers are not able to quickly find and fix whatever might have caused it -- launch likely will face an additional delay. Endeavour's current launch window extends through May 29. The next available window opens June 19 based on temperature constraints related to the space station's orbit. Only two fights remain on NASA's shuttle manifest, Endeavour's mission and a final flight by the shuttle Atlantis that is currently scheduled for launch June 28. Endeavour's launch delay likely will trigger a slip for Atlantis, but managers have not yet made any official changes.